Co-host of the Wednesday Evening Sun blues show Grooving Down the Blues HIghway. 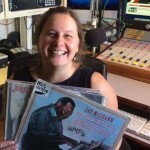 I've been a WMPG DJ since 1994 when I was a student at USM. My first show was "Beck's Blues Breakfast" airing 4:30-6:30am. I was the host of the Friday Evening Sun show from the late 90's to 2002. After over a decade off the air, I'm thrilled to be back on WMPG, co-hosting every other week alternating with Mike Halmo. I grew up in a musical family with my mother who sang and played the piano and my dad who plays the banjo, guitar and mandolin. I have fond memories of going to bluegrass festivals all over the state of Maine as a child. I learned to play the upright bass and along with my husband who plays the guitar, we played with the Muddy Marsh Ramblers bluegrass band from 1999-2011. I love playing the upright bass and have a deep appreciation for all kinds of music. The Blues have always been a favorite genre of music for me because of it's history, the soul, the groove, the swing and I absolutely love it. I share my favorite shades of the blues including acoustic country blues, big band swing, jump blues, classic r&b and blues inspired rock and roll. The roots of American music is the Blues and I love it! Hope you'll tune in!